The Mendoza province is a land of intense beauty. The landscape diversity of vineyards reaching out to the horizon and the mighty Aconcagua looming above creates a stark contrast of mountain and valley. An excursion from the city of Mendoza to the Argentine/Chilean border offers the chance to see one of the most beautiful places on the planet and traveling by car allows the opportunity to stop and smell the roses. This outing can be done in a long day, an overnight trip or as a means of traveling into Chile. Here is a detailed play by play of the special spots not to miss. From the Mendoza metropolitan center take Ruta 40 south 26 kilometers. Veer left on Ruta 7 traveling west to Uspallata and Chile. Once joining Ruta 7 the landscape becomes rolling vineyards, bodegas and cattle ranges. It is easy to forget that not far behind is a city of over a million. During this part of the drive you pass under the Cordón del Plata. This is the front range of mountains that you see from the city. Nestled within this subrange are great excursion facilities with lodging and restaurants. Posta Chacritas is located 70 kilometers from the beginning of the drive. It is a 900 hectare (2,223 acre) ranch that offers welcoming accommodations and guided horseback, rappelling, trekking, mountain biking and canopying trips. Twenty kilometers beyond you will come across the small town of Uspallata. There are hotels, restaurants, internet, gas stations, banks and all of the other necessities of travel located in this small village. Another six kilometers down the road is the Estancia La Alejandra. This is a beautiful ranch that has kept its charm from days gone past, yet is fresh and welcoming. Its rooms have been recently remodeled and room service is offered. There is a restaurant and wine bar. The establishment offers guided trips for horseback riding, trekking and wineries. The estancia is placed within the Valley of Uspallata. This is an area of vibrant green created from the rain shadow of the gigantic mountains towering above. The green land is a stark contrast against the red, purple, orange, yellow and pink rock mountains that rise from the clear waters of the Mendoza River. There are beautiful viewpoints throughout this area showing the diverse rainbow colors of the rock and the crystal-clear waters of the rivers. Fifty four kilometers farther down the road you will come across the small area of Punta de Vacas. This is where the two rivers, Las Vacas and Tupungato, flow into the Mendoza River. This is also the trail head for Mount Tupungato (6800 meters/22,309 feet) and another access point for the summit of Aconcagua (6959 meters/22,831 feet). it boasts 300 hectares (741 acres) of ski terrain and twenty eight runs. It is also an arena of fiestas and celebrations, such as torchlight parades, downhill race events and wine and cuisine tastings. Another seven kilometers along Ruta 7 brings you to the Puente del Inca. This is an Argentinean national treasure and a great part of the heritage. It is also a geological masterpiece. The natural sulfuric bridge was created through the hands of time. Scientists believe that the Mendoza River was filled with ice, snow and rock debris from severe avalanches, creating a temporary bridge that the sulfur water of the local hot springs flowed upon. The sulfuric water slowly created a platform that withstood its own weight once the snow and ice melted away, forming a bridge. The water of this site is considered to have considerable healing properties. It was a spiritual and healing place for the Inca people, as well as native Argentineans through the centuries. It was also created into an exclusive hotel and spa in the early 1900’s. Besides the natural engineering phenomenon of the bridge, there is also a feria artisanal (local craft fair) at this stop. There is a bountiful amount of beautiful stones and gems available that were found in the area. Well made, gorgeous, hand- knitted sweaters are also in plentiful supply. Four kilometers past the Puente del Inca is the main entrance into the Aconcagua National Park. The park is a place of pristine and awe-inspiring beauty; an appropriate frame to the highest peak outside of the Himalayas. The Rio de las Vacas flows from the head of the Aconcagua valley. The clear water of the glaciers has large boulders the size of houses in its bed, giving evidence of the flowing water’s immense strength. There is a basic, hour long trail that does a circuit from the paved parking area. 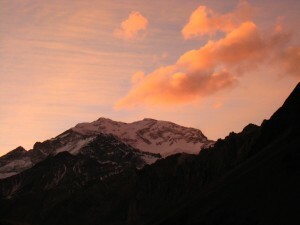 The broad mountain and summit peak of Aconcagua can be seen the entire time. The hike is self-guided and explains the topography, names of the neighboring mountains, as well as flora and fauna. Eleven kilometers farther down the road is the small village of Las Cuevas. This is the end of the road for Argentina and the border crossing into Chile. Las Cuevas was once a bustling town with multiple hotels, dining options and infrastructure but time has not been friendly. It is mostly a ghost town today, though there is a small eating establishment and hostel. The main attraction of the area is the Cristo Redentor that is located at the high point of the La Cumbre pass at 3,832 (12,572 feet). Cristo Redentor is a seven meter (23 feet) high brass statue of Christ the Savior that sits on a six meter (20 foot) high granite platform. It was erected in 1904 in appreciation of peaceful resolution of border disputes between Chile and Argentina. The road up to the Cristo is a steep, windy dirt road, only to be done in the summer, but well worth the effort. 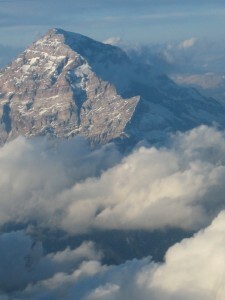 The views of the multiple, six-thousand-meter-and-up peaks are, by far, the easiest to obtain. Cristo Redentor brings us to the end of the journey. One must decide to travel on to Chile or go back the way we came. In my experience the drive in the opposite direction gave a fresh perspective to the natural beauty of the area. Plus it was another excuse to stop at a different trail that I wanted to explore. But there is no right or wrong answer; go where the heart wants to travel. Shanie Matthews is a freelance writer living permanently in Bariloche, Argentina. She enjoys the pristine beauty of Nahuel Huapi National Park and the incredibly frequent sightings of Condors in the area. You can read about her and her husband’s experiences on their blog, Living in Patagonia. This page rendered in 0.473 seconds.